Courtesy of Catalina Channel Swimming Federation, Catalina Channel>, California. For decades, Dottie York put in countless hours and years volunteering and organizing crossings of the Catalina Channel for the Catalina Channel Swimming Federation. She volunteered her services for a number of ocean swims including the 1984 USA Long Distance International Championships held in 1984 where FINA officials observed and considered the inclusion of marathon swimming in the Summer Olympics. She was the mother of famed channel swimmer John York and received the 1998 Glen S. Hummer Award, the highest honor given by USA Swimming for service to the sport of open water swimming. 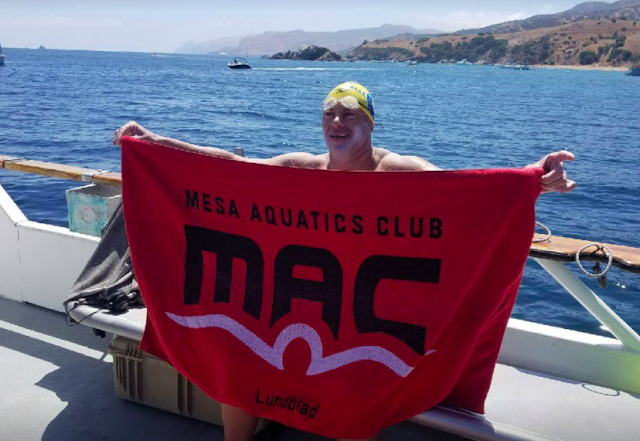 The Catalina Channel Swimming Federation established the Dottie York Scholarship Fund in her honor upon her passing and has been selecting worthy candidates for years. This year, Bradley Lundblad of Gilbert, Arizona was selected and made the best of the committee's choice. 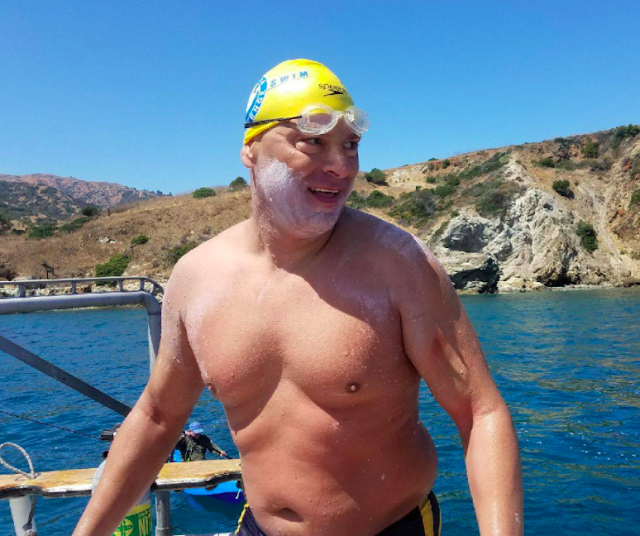 According to the Catalina Channel Swimming Federation, Lundblad reversed his planned course and opted to swim from the Southern California mainland to Santa Catalina Island - typically considered the more challenging direction - and completed his crossing in 13 hours 45 minutes. "It was the hardest swim of my life. I left from the mainland because of the tides," recalled Lundblad. Bradley has completed 11 successful lake crossings between 2013 and 2016 at the SCAR Swim Challenge in land-locked Arizona, but this was his first major swim in the Pacific Ocean. He was accompanied by SCAR Swim Challenge event founder Kent Nicholas and Timettra Wellington and Linda Bamford as observers on board the Pacific Star.